Art makes our lives better. Ask a psychiatrist or your friend, ask an academic or the guy from the supermarket; all of them will give you the same answer: art treats the soul! One doesn’t need to be an expert to appreciate or appropriate art. Art is being perceived as a harmonious creation by intuition, instinct, and by heart. However, it wouldn’t really hurt to open a book and learn more about the history of art. It would actually increase the amount of satisfaction and pleasure derived from the encounter with the story and development of art and its influence on human history. As for contemporary art in particular, I do understand that it occasionally makes people … anxious. It seems at times to be far too complex or pretentious for many… Even if I can recognize the fact that an argument like this holds a certain amount of truth, as I have found myself staring awkwardly at the walls of several galleries sometimes trying to make sense of what had been pompously displayed. However, I strongly believe that contemporary art can also generate genuine excitement. In order to convince you, I will invite you to take a look at an event that took place only last week in Milan, Italy. Even if the event was not an art exhibition per se, but rather a fiesta of cutting edge design, it does look quite interesting and very arty. It was there, in the Salone del Mobile2013 (a prestigious international exhibition of design) that the most original MINI ever created was displayed for the public eye to gaze upon, explore, admire and be stunned! The MINI KAPOOOW! This most original MINI has been created by the MINI Design Team led by Anders Warming. Its impressive design brought a new insight on how a MINI can possibly look like. 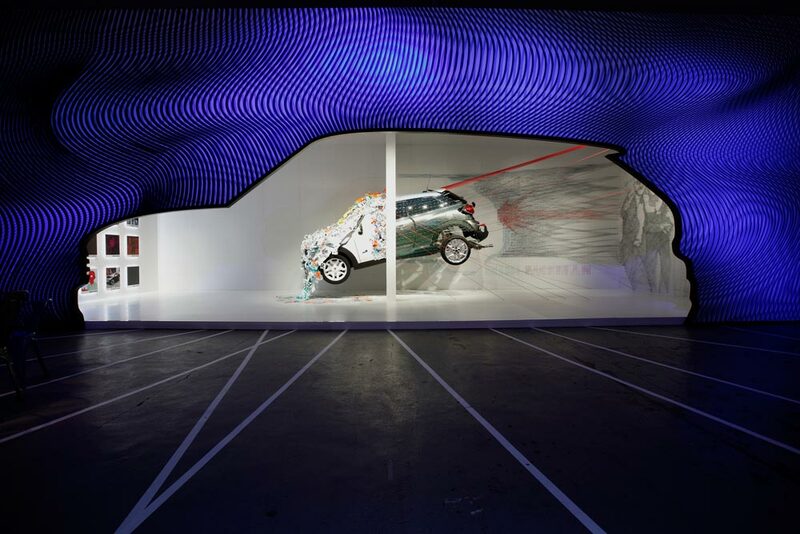 The installation invites the visitor to take a thorough look at a multidimensional MINI Paceman – the famous brand’s latest model. Before you start searching for new car deals from MINI, craving badly for the MINI Paceman, let’s see together why this particular installation will make you thrilled, awaking your senses and the crave for driving a brand new urban car. First of all, the MINI KAPOOOW is as pop as it gets, as even the name suggests. To be more precise, the whole idea of its concept brings in mind both a pop concept along with the aesthetics of graphic novels narrating the tales of super heroes. The general idea behind the concept was that MINI cars generate emotions. In other words, that MINI is a product with a character of its own, a car able to break the norms. As its advertising campaign puts it, MINI is NOT NORMAL. The creators of the installation presented a MINI of two worlds. 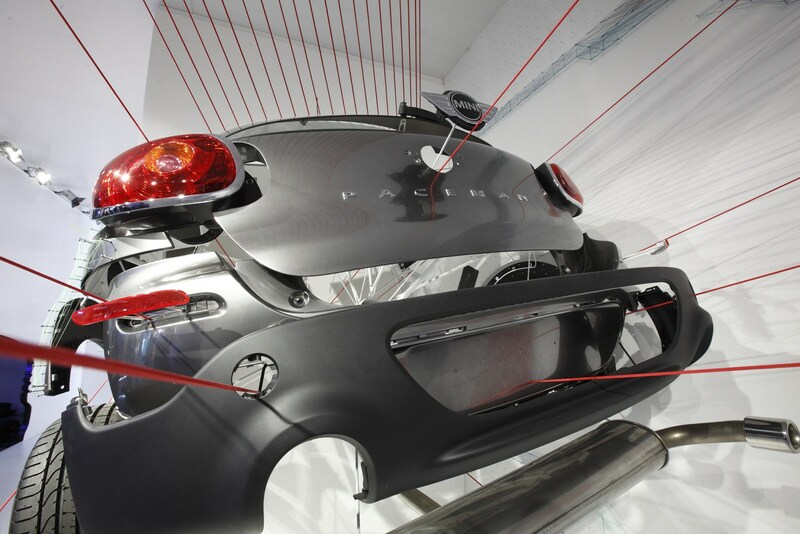 In the first side of the displayed installation, you see the back side of the car with its components seemingly flying away from or gravitating around the vehicle, as a mere symbol of the car’s metamorphosis, which takes place on the other side of the wall that separates the hybrid Mini. At the same time, the car is “connected” with the people pictured on a wall – and they all seem so enthusiastic about it! No wonder! In the second part of the installation, the MINI Paceman is completely transformed. By passing through a wall, it seems that MINI acquires a totally different character. Most of its surface area is covered by paper and colored tabs which are indicating the prototype of every creative process. Furthermore, iconic MINI models ,as well as famous personalities of the art world are mentioned on these tabs, creating a ‘wall of fame’ for everyone to admire and enjoy! The installation brings in mind nothing of the extravaganza of contemporary art, despite being perfectly integrated in this realm. This MINI installation is simply creative design at its best! And, if it is to think of a brand that invites creative design like no other, then that certainly is the mini cooper. Worshiped back in the 1960s, MINI is still considered the epitome of cool for many young drivers across the globe. Even though the MINI I presented earlier is not exactly… drivable, it certainly adds something to the myth… and it certainly inflicts the urge for driving!